This last week we have witnessed a disturbing rise of hateful attacks and the incitement of violence against Representative Ilhan Omar. On April 11, 2019, The New York Post, published a fabricated accusation against Representative Omar that featured a photo of the World Trade Center. Prior to the Post’s deceitful attacks, Fox and Friends host Brian Kilmaeade made hateful remarks questioning Omar’s Americanness, “You have to wonder if she’s an American First.” Alarmingly, on Friday, April 12, 2019, President Trump tweeted a video clip falsely citing Representative Omar and the 9/11 attacks, further provoking violence against Muslims and immigrant communities. 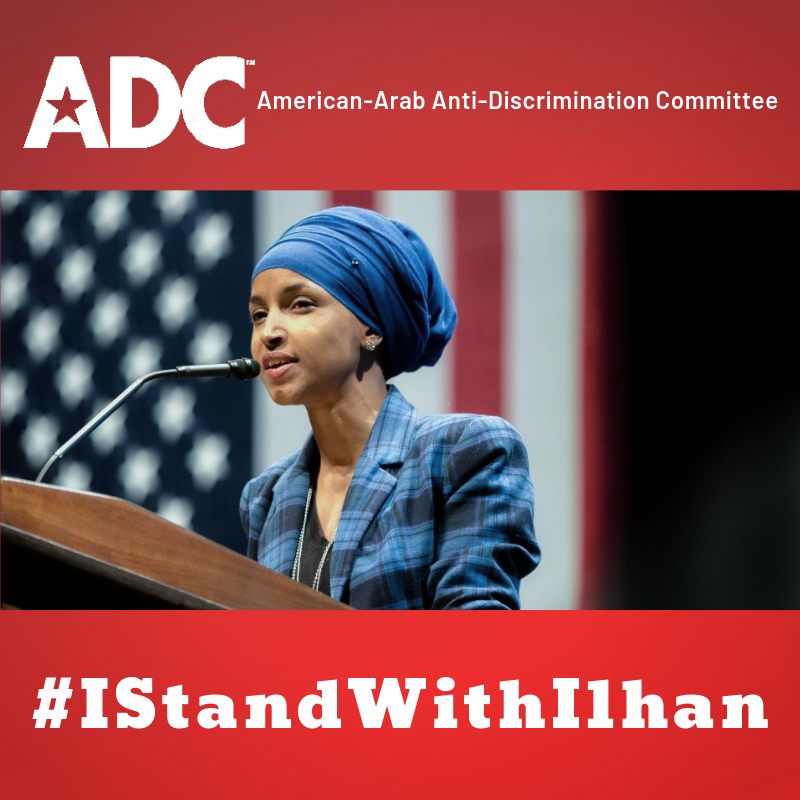 The American-Arab Anti-Discrimination Committee (ADC) unequivocally condemns the hate-based smear campaign against Representative Omar and the incitement of violence against communities of color across the U.S., in particular towards Muslim Americans. Let us be clear, these attacks are rooted in the deep seeded racism and injustices that Representative Omar courageously continues to speak out against. We expect all members of Congress to demonstrate Representative Omar’s affinity for justice and will continue to applaud her for it. The ADC will not silently tolerate this repeated pattern of Islamophobic and racists rhetoric towards Muslim Americans and immigrant communities in the U.S. Just recently, the ADC joined more than 150 progressive leaders in a joint letter stating our solidarity with Representative Omar and affirming we stand united against the rise of Islamophobic attacks and the attempts to divide us as a people. Congressional leadership must act now to immediately to condemn this pattern of racism and hold the President accountable for using the office of the Executive to provoke hate and bigotry. 1) We demand a public apology to Congresswoman Ilhan Omar, Muslim Americans, and minorities who have been persistently victimized by the New York Post’s propaganda that spreads nothing but hate and fear to the streets of New York City. 2) We demand the New York Post change their cheap and sensational tabloids that undermine national unity and entice violence and hate for the sole purpose of circulation and sales against minority communities. 3) We demand the firing of New York Post’s editor in chief Col Allan who has demonstrated a clear viciousness and intent to spread racism and hysteria that leads to violence against our communities, especially in times when Islamophobia is at its highest levels. 4) We demand elected officials/government officials to stop giving the New York Post any platforms to spread hate and racism in this multicultural city and across the nation at large.